Karela juice, a juice extracted from bitter gourd, is sometimes difficult to find in stores so you might try growing your own gourds and making the juice yourself. When consumed in moderation, karela juice is used as a folk remedy to help a with weight loss, blood disorders and bad hangovers; it can even help lower blood glucose levels in diabetics. A juicing machine might be the obvious choice for extracting karela juice, but you can make the juice with your household blender instead of shelling out hundreds of dollars for a quality juicer. Cut the skin from the bitter gourd with a small kitchen paring knife. Wash the gourd under cold running water and place it on a cutting board. Slice the bitter gourd down the center with a kitchen knife. Scoop out the seeds and white flesh from the bitter gourd with a spoon, leaving the green outer section. Cut the outer green flesh of the bitter gourd into small- to medium-size cubes. Use a sharp knife. Scoop the bitter gourd cubes into a bowl and cover them with water. If you want to off-set the bitterness, you can soak the cubes for about 30 minutes in a bowl of water with about 1/2 teaspoon of salt or juice from half a lemon. 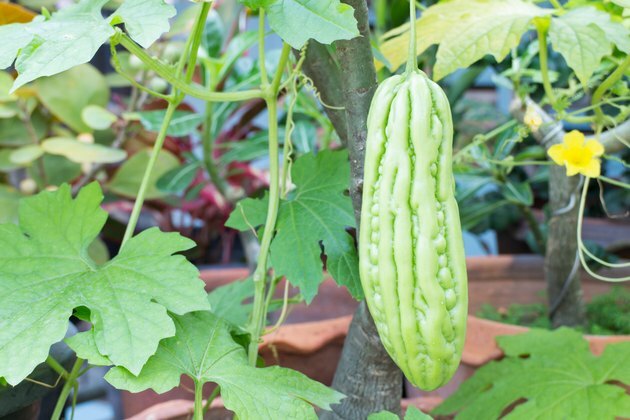 Add the bitter gourd to a blender. Pour water, apple juice or lemon juice into the juicer or blender to lessen the bitter taste, making the karela juice more palatable. Adding honey, black pepper and ginger also helps with making the karela juice tastier. Blend the ingredients until the juice is smooth and uniform. Place a wire mesh strainer or several layers of cheesecloth over a bowl or glass. Pour the juice through the strainer to remove any solid pieces of the bitter gourd. Press the solids against the wire mesh with the back of a spoon or squeeze the cheesecloth to extract as much juice as possible. Place the karela juice in the refrigerator to chill between 1 to 2 hours. Pour the karela juice into a serving glass; top the juice with a sprinkle of black pepper or chaat masala and serve. It is generally recommended that you drink karela juice in the mornings on an empty stomach for full beneficial results. Sweeten karela juice with honey, but avoid other sugars which can alter the taste and health benefits. If you have a juicing machine, you can simply process the saltwater-soaked cubes through the juicer instead of blending and straining the cubes. Consult your physician before beginning a karela juice regimen, particularly if you are on medication to help with high blood glucose. Karela juice used in combination with these medications can cause drastically low blood sugar.